When I was in elementary school, my parents would check my homework each night. Math problems, language arts, all of it. They’d point out errors (before there was a thing called typos) and make me go back and fix it, until I had a clean assignment to turn in. While it would sometimes frustrate me, it taught me early on the importance of attention to detail. At that time, I was rushing through things quickly because it wasn’t much of a challenge, and I just wanted to be done with my homework so I could read. My dad impressed upon me as early as age six that sloppy work doesn’t cut it, whether it was in my homework assignment, while completing a chore, or playing sports. It definitely made an impact – I am a self-acknowledged neat freak, I once organized my CDs and books by genre and artist/author, and I have a solid membership in the grammar snob squad. In my very first semester of college at Miami University, I learned another important lesson about details from my English professor. For each book we read, Don had us write our analyses in the form of a letter to him. “Dear Don,” each one would begin, and then we’d outline our thoughts on stories from Hemingway, Fitzgerald, James, Wharton, and more, weaving in our own experiences with love, loss, travel, and friendship. Don would write us back with little Post-its and margin notes, filled with bits of wisdom and words of affirmation or understanding. “Me, too!” or “I agree!” were common. But the best ones were his gentle critiques and prompts to get us to show more and tell less, to use real examples, and to dig deeper. “Do you have a story, Jenna?” he’d write. Or “I need more details!” My foundation was all there, and I got the concepts, but I was too vague in my examples and not detailed enough in my descriptions. 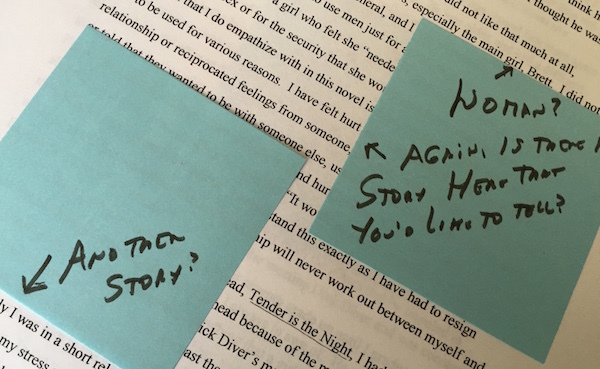 Don knew my writing could have more to it, and he pushed me to explore it. I continued to look for the details as a reporter on my school paper, and then in my newspaper internships throughout college. Once I began work in digital communications for nonprofits and foundations in 2007, my writing took a different turn. While I had to be accurate with stats and program information, I was frequently told that shorter is better, and so long-form stories about the people these organizations supported went out in favor of 200-word blog posts and soon, 140-character tweets. General descriptions and umbrella messaging took precedent over exact details and deep dive storytelling to appeal to multiple audiences and drive actions and donations. On the side, I continued to write in my personal blog, alternating between specifics and big concepts about self-reflection and growth. In recent months, I’ve picked up storytelling again as I pursue a more focused freelance writing career. While I adore reading fiction, I’ve always preferred nonfiction or historical fiction to creative writing, which is why I so loved my days at newspapers. As I’m interviewing people for their stories, I’m put back into a place where the details matter: ages, names, physical traits, quirks, interests. There is no fudging here or creating a character upon which someone is based. These are real people, with real stories. As I get back into this pattern, I’m applying it to my work with nonprofit clients when they want stories, and ultimately, I truly believe the details that make a person who they are resonates with donors more than anything else. It was so like Don to ask for more detail – and I needed the reminder. 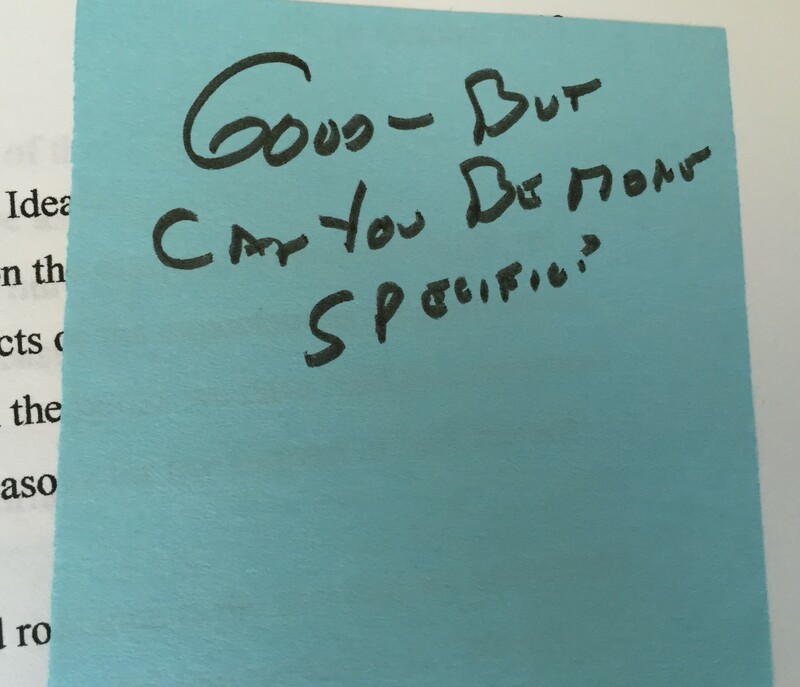 He pointed out a few places that could use specifics, and when I added them in, he was right of course. The story really was better for all of its tiny little details. Just think of all the things you read each day or shows or movies you watch, or music you listen to. Or think about your own experiences and memories. While the theme or the action or the beat may provide for a great foundation, it’s the specifics that bring it all to life – the colors, tastes, sounds, or the words. When we care about the details, it makes our work and our stories more complete, more real, and more impactful.